Michelle Harrison from Wise on Wood (WOW) won the Trainee of the Year at the Northland Wood Council’s Northland Forestry Awards in July this year. Michelle and her husband Nigel have owned and operated Wise on Wood harvesting crew for two years, and they are stand-out contractors for PF Olsen in the Northland Region. Michelle has excelled in the often overlooked or downplayed parts of harvesting. Her attention to detail in the interpersonal relationships, health and safety systems and environmental excellence is outstanding. She has even been nick-named “brains” by the crew as a result of her innovative and forward thinking. Michelle started in the crew with log making on the skid and through training acquired her Landing Operations National Certificate Level 3. She then took on the role of skidder operator and subsequently harvester operator and she achieved her Mechanised Processing New Zealand Certificate earlier this year. On top of all this she has spent endless hours at night researching and keeping up with industry knowledge, of which she shares daily her learnings with the crew. Michelle has also achieved a Level 4 National Certificate in Occupational Health & Safety and has become a Contract Assessor for Competenz. She has also achieved a level 3 National Certificate in Business. 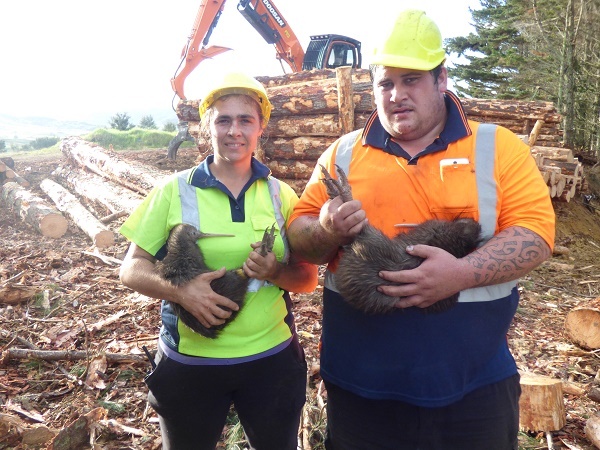 Wise on Wood recently harvested a small Landcorp stand (around 20ha) which contained at least 11 Kiwi, eight of which had transmitters attached so they could be monitored during harvesting. Michele worked with Department of Conservation staff and on a daily basis she located these birds and kept them out of harms' way during the entire operation. This took around two hours a day which was outside her normal days’ work! Wise on Wood is a crew that we can rely on to do an outstanding job. They not only do what they are asked, but they do it well and Michelle is a very large part of this. On top of this Michelle has a young family (two boys) whom she is very proud of and she enjoys swimming coaching, being on the school board of trustees, and numerous outside work activities. No wonder they are called WOW!